First Impressions of Windows 8 » Accounting Advisors, Inc.
On October 26, 2012, Windows 8 officially became the latest version of Microsoft's flagship operating system. With previous Windows upgrades, you could pretty much be up and running on a new PC quickly – well as long as you weren't using Windows Vista. To me, Windows 8 feels designed to stop you in your tracks at every turn, or makes you jump through unnecessary hoops until you get the lay of the land. You're going to experience this to a lesser extent in Office 2013 as well, as I'll explain in the coming weeks. Here, I'll describe my initial experiences with Windows 8 in hopes that it will aid your eventual transition. Windows 8 perpetuates the current peek-a-boo fad software designers have embraced as of late. Long-term computer users are accustomed to always seeing a button or menu through which they can access programs or features. This simultaneously goes out the window and gets skewed in Windows 8. 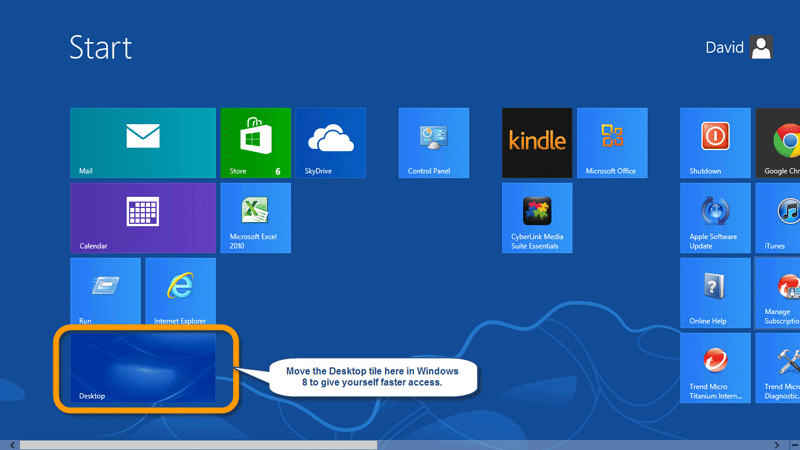 Many Windows 8 features require you to move your mouse to a particular location on your screen and hover. For instance, you won't see a visible Start button, nor will you initially see a taskbar, but rather a “start panel” that is comprised of tiles. Think of these tiles as icons on steroids. Tiles can be of various sizes and may blink at you to the point of distraction. My first order of business was to remove all of the blinking tiles, and I'm slowly accumulating tiles that let me access features and programs that I actually use. However, this start panel isn't your actual desktop, at least not in a traditional Windows sense. 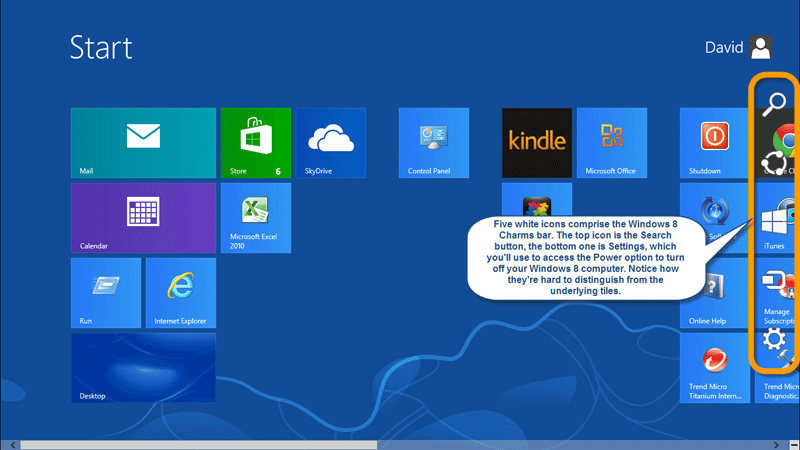 To get to your true Windows desktop, you'll click on a tile labeled Desktop, as shown in Figure 1. When you locate your desktop, you can place icons on it just as you would in previous versions of Windows. The desktop also has a taskbar that you can pin items to as you may have done in Windows 7 and earlier, as shown in Figure 2. In essence you'll have two desktops, whether you like it or not. The start panel is a re-imagination of the traditional Start menu (did I mention that the start panel scrolls to the right when your mouse touches the right edge of your screen?). 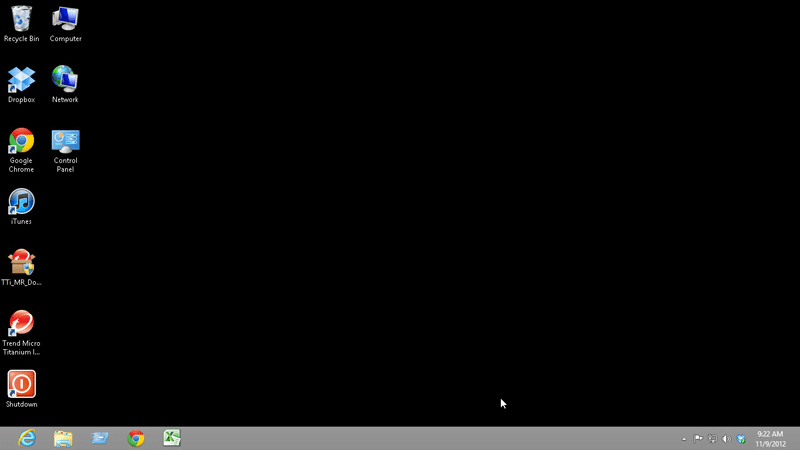 Once you've launched your desktop by clicking on its tile, you can return to it by pressing Alt-Tab, or access the start panel again by moving your mouse to the lower left-hand corner of the screen, hovering for a moment, and then clicking the Start button that appears, and then clicking on the desktop tile again. 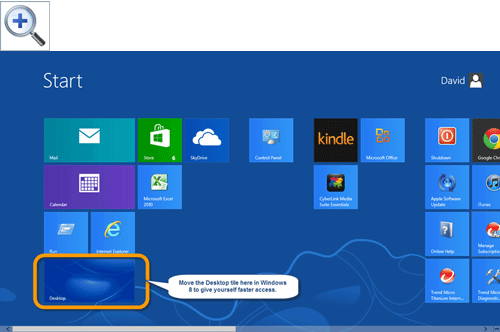 Figure 1: Windows 8 doesn't offer a start menu, and only indirect access to a Desktop screen. 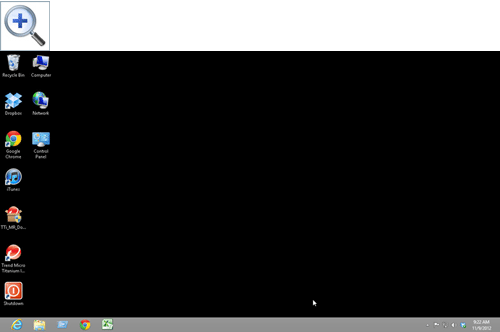 Figure 2: You can establish a traditional desktop and taskbar in Windows 8. Moving your mouse to either corner on the right-hand side of your screen reveals a hidden toolbar known as the Charms bar, shown in Figure 3. The first icon on this panel is a Search command, which I've found to be the most useful feature in Windows 8. You can use this panel to search for programs, files, or features such as the Windows Control Panel. You can then pin selections from the search results list to your desktop, start panel, or taskbar so that you can find them without searching again later. 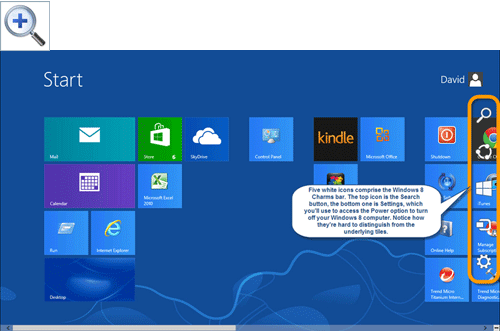 Figure 3: Many Windows 8 features, such as the Charms bar, require you to move your mouse to certain screen positions. Move your cursor to either corner on the right-hand side of your screen to display the Charms bar. Within the Charms bar click Settings. Within the Settings panel click Power. Within the Power section choose Sleep, Shut Down, Restart, or Update. A couple of undocumented methods for shutting down a Windows 8 computer include holding down the Power button on the front of your PC, or yanking the cord out of the back of the computer. Yes, I know these aren't appropriate, but you'll be tempted. In short, all of the functionality that you're accustomed to is available in Windows 8, but you're going to have to dig to find it. Microsoft has foisted on us a grand vision of a single operating system for all devices. I can see where Windows 8 could be useful on a tablet device, but on a traditional, non-touch screen computer, it's been an exercise in frustration. There are some aspects of Windows 8 that I do like, and I'm sure over time I'll acclimate to the changes. If you're intrigued by Windows 8, make sure that you plan adequate time to get up to speed. In my experience, it's an operating system that focuses on bells and whistles rather than productivity. Hopefully Microsoft will recant and give professionals the ability to turn off the glitz and actually get some work done.